More from Deedy about this guy named George. 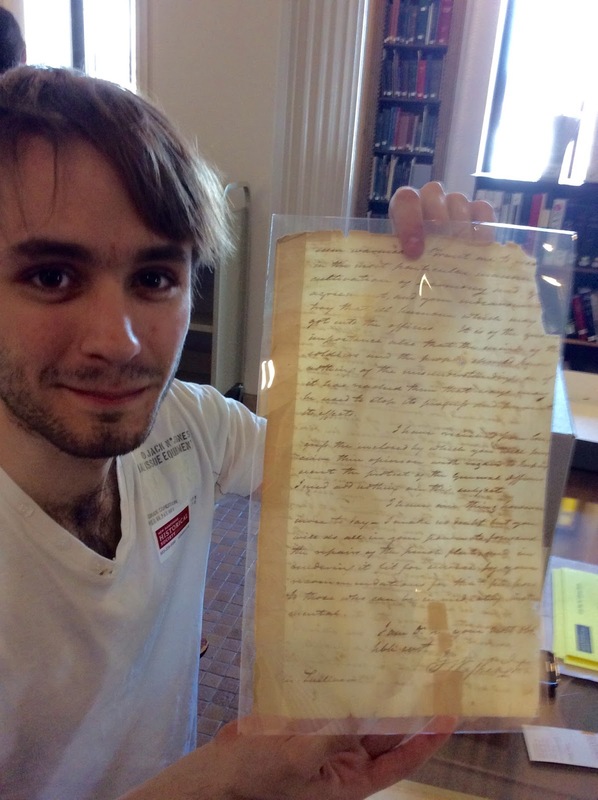 In a recent blog post, I talked about the letter written by George Washington that we were privileged to read on a visit to the New Hampshire Historical Society a few weeks ago. I was able to photograph this missive, and subsequently spent hours trying to puzzle out what Washington said. What with having some bits missing (note torn corner in the picture), and 18th century spelling idiosyncasies (such as a large F-like letter to represent double Ss) there were still a few words I couldn't make out. Then I looked around the internet and found the whole thing posted at the National Archives. Here is the link. In any case, I found this letter to be quite revealing, not only of Washington's diplomatic skills, but also of a surprising sense of humor he put to use to mute the "dressing down" he is giving to Sullivan. I don't usually think of Washington as being gifted in diplomacy, but please notice what he did in this letter. It is particularly impressive because Washington himself was probably very upset by the rift in the new alliance, which Sullivan had made even worse. As he says himself, "The disagreement between the army under your command and the fleet has given me very singular uneasiness." Nevertheless, Washington manages to give Sullivan a couple of "outs" before lowering the boom on his angry general. 1) First of all, he states that he has not heard from Sullivan since August 23, but says that Sullivan's messages must have gone astray. 2) Secondly, Washington says this of the French: "In our conduct towards them we should remember that they are a people old in war, very strict in military etiquette, and apt to take fire when others scarcely seem warmed." As you can see by the emboldened text, Washington makes a small joke implying that the French are overly touchy. In other words, he is suggesting that the French are so easily enraged that perhaps it is not completely Sullivan's fault that they are angry or offended. Then, however, Washington goes on to make it clear that Sullivan must keep his mouth shut and do everything he can to keep the news of the "misunderstanding" between the French and Americans quiet. "It is of the greatest importance, also, that the minds of the soldiers and the people should know nothing of the misunderstanding, or if it has reached them that ways may be used to stop its progress and prevent its effects." How thrilling it was to read the actual words written by Washington, and to see his diplomacy (and possibly his sense of humor) at work! Head Quarters White plains 1st Septr 1778. I have not received any letter from you since the 23d [August] which I attribute to some mishap of the messengers with whom they were sent. I was anxious to learn the determination and designs of the council of officers, that so I might be prepared for eventual measures—The success or misfortune of your army will have great influence in directing the movements and fortune of this. The disagreement between the army under your command and the fleet has given me very singular uneasiness. The Continent at large is concerned in our cordiality, and it should be kept up by all possible means that are consistent with our honor and policy. First impressions, you know, are generally longest remembered, and will serve to fix in a great degree our national character among the French. In our conduct towards them we should remember that they are a people old in war, very strict in military etiquette, and apt to take fire when others scarcely seem warmed. Permit me to reco⟨mmend⟩ in the most particular manner, ⟨ the ⟩ cultivation of harmony and go⟨od⟩ agreement, and your endeavours to ⟨des⟩troy that ill humour which may ⟨have⟩ got into the officers. It is of the greatest importance, also that the minds of the soldiers and the people should know nothing of the misunderstanding, or if it has reached them that ways may be used to stop its progress and prevent its effects. I have received from Congress the inclosed by which you will perceive their opinion with regard to keeping secret the protest of the General Officers I need add nothing on this subject.